Mad River Glen has nine ski clubs with houses on (or near) the base of the mountain. All of them have a rich tradition and history here at Mad River Glen. Each club is unique in its own way but all are traditional elements of the Mad River Glen experience. Our founder, Roland Palmedo, was the founder of the Amateur Ski Club of New York and he understood the value of luring other clubs to the mountain. Many of Mad River’s long-time skiers are associated with one of our on-mountain clubs and we see many third and now fourth generations of Mad River skiers still associated with their clubs. We’ve even seen a few “inter-club” marriages! Check out this story about on-mountain ski clubs at Mad River Glen. Here is a bit of information about our on-mountain ski clubs. The ASCNY was founded under the guidance of Roland Palmedo in April of 1931 ”to promote skiing by a congenial group of amateurs living in and around New York City”. It was the second downhill ski club formed in the United States. There were 71 members for the 1931-32 season. That first season the exploratory governors discovered Stowe, Vermont, which was reachable by train to Waterbury and then a ride on the 10-mile electric trolley into Stowe. Club members sold their interest in the Lift. Co. in Stowe in 1946. They then bought General Stark Mountain and created Mad River Glen as their new principle ski area. The Club member voted overwhelmingly in 1956 to locate and build our home lodge on land that the Mad River Ski Area gave them. The Hartford Ski Club (HSC) was founded in 1936 by skiing enthusiasts who wanted to foster interest in both the recreational and competitive aspects of the sport. The HSC was founded on two basic principles: a low cost approach to skiing and member involvement in club activities These characterize the Club’s informal, happy, low-key but well organized approach to skiing. The Montclair Ski Club, founded in 1947, is a tightly knit group of avid skiers and their families. Amid the fun of skiing, the club promotes a community atmosphere where cooperation and warm personal relationships are valued. On winter weekends at our 40-bed lodge at the base of Mad River Glen, we enjoy skiing, eating and socializing together. Outside of the ski season we also hold various social activities, in both New Jersey and Massachusetts. Our active members participate in the running of the club by serving on committees and boards, attending regular meetings and collectively maintaining the lodge. The Montclair Ski Club is a member of the New Jersey Ski Council and encourages its members to participate in its activities. Miramar Ski Club was founded in 1949. The key to the club’s long-term success mirrors the vision of MRG founder Roland Palmedos. By engaging skiers’ personal involvement, attachment and loyalty the club has been operating for more than 60+ years. The club is focused on providing all levels of skiers, its members, their families and guests, with a sociable and affordable environment to enjoy winter sports. The club is an offshoot of the Miramar Yacht Club in Brooklyn. Members wanted an activity to fill the cold months so they weighed anchor and headed north to Vermont. 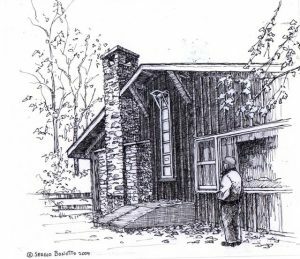 In 1962 the club purchased property, an old gristmill near a covered bridge, in the Mad River Valley. Two years later the Miramar Ski Club had opened its doors in Waitsfield where you can find an original MRG single chair proudly on display. 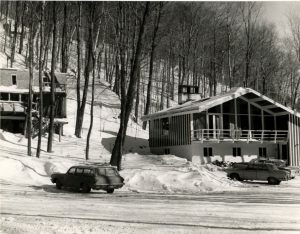 In 1959, the club built a ski lodge at the base of Mad River Glen in northern Vermont. The club is focused on providing avid skiers and their families with a warm, caring environment where personal relationships are valued. Currently there are several second and third generation club members. Ramapo Mountain Ski Club, established in 1947, is based in northern New Jersey and southern New York and most members live in Bergen County in NJ, and Rockland and Orange counties in NY. The club welcomes downhill (alpine) skiers, snowboarders, and Nordic (cross-country/XC) skiers. The club is also family friendly. The club has a 40-person lodge at Mad River Glen in Waitsfield, Vermont and the lodge is a short drive to Sugarbush Resort in Warren, VT. RMSC is one of 50 clubs affiliated with the New Jersey Ski Council. The Sterling Ski Club was founded in 1937 by a group of six enthusiastic skiers in Stratford, Connecticut. They have had a house on the mountain at our Sugarbush’s Mount Ellen for sinc 1973 & has over 400 members. The Swiss Ski Club of New York was founded in New York in 1939, and our membership now represents national backgrounds from all over the world. In the winter, we meet regularly in New York City and go skiing or snowboarding at our club’s lodge in Waitsfield, VT, near the Sugarbush and Mad River Glen ski areas. We encourage new friends to meet us at our NYC area events and to come with us to Vermont. Members of the White Plains Ski Club have been enjoying skiing, winter and summer sports and outings and each other’s company for almost 50 years. Skiers and non-skiers alike are invited to join us and discover our spacious and comfortable ski lodge within walking distance of the legendary Mad River Ski area in Waitsfield, VT. The WPSC is a fun and affordable way for you and your family and friends to enjoy skiing in winter and the beautiful Vermont countryside year-round. Be sure to check out the Lodge Photos . . . link on our home page.